How to watch LEGO Ninjago: Masters of Spinjitzu: Happy Birthday to You! (2017) on Netflix Netherlands! 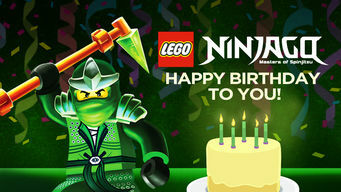 Yes, LEGO Ninjago: Masters of Spinjitzu: Happy Birthday to You! is now available on Dutch Netflix. It arrived for online streaming on October 4, 2017. We'll keep checking Netflix Netherlands for LEGO Ninjago: Masters of Spinjitzu: Happy Birthday to You!, and this page will be updated with any changes. LEGO Ninjago heroes Kai, Zane, Jay and Cole want to wish you a happy birthday, but they're going to need all their Spinjitzu skills to do it!